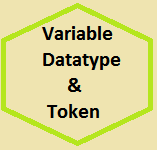 C Programming Variable or only Variables which are essential components in C programming. A variable that can hold a data when we want to execute a c program. without variable we can not handle a lot of data in any programming. Dear reader, here i will discuss details about c programming variable that will be helpful for your learning c programming. float or string type data. A variable must be declared before using it. Also a value can be initialized at the time of declaration of a variable. 2. The first character of a variable must be a letter or underscore. Example: #name, first name, +.temp are illegal. 4. Any C keyword cannot be a variable. Example: int, float, main are illegal variable. Example: x & X are not same, name and Name are not same variable. 6. Variables must be declared before use it. Printf(“Value of x is:%d “,x); //display value of int value x.
if you want to run the above Two Program then you have to save as Like : “example.cpp” (cpp means c plus plus) then compile & run.